CannonDesign is proud to share Advocate Good Samaritan Hospital’s West Pavilion has officially achieved Leadership in Energy and Environmental Design (LEED) Silver certification. The leading benchmark in green building, LEED positively evaluated the West Pavilion across key criteria related to sustainability including materials used, energy use and water efficiency. What makes this certification notable is the West Pavilion encompasses both existing floors and new construction, completed last year as part of a vertical expansion. Per LEED requirements, such a vertical expansion cannot be considered a LEED building without inclusion of the existing floors – which happen to contain the intensive care unit, a hospital department notorious for high-energy consumption. Therefore, the existing ground and first floors were included and addressed, as required, in calculations and documentation for LEED certification. The overall design of the expanded West Pavilion focuses on reducing water usage, improving energy performance, and includes environmentally friendly materials — such as low-emitting finishes and products that were regionally-sourced or contain recycled content. 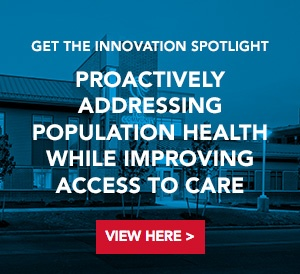 Looking to go beyond just expanding the bed tower, Advocate Good Samaritan Hospital aspired to develop a best-in-class facility that prioritized the patient experience while promoting operational efficiencies. Constructed atop the current Intensive Care Unit (ICU) and designed within the existing footprint, the new bed tower expansion includes three floors of inpatient nursing units, conveniently linking back to the remainder of the hospital. The newly expanded West Pavilion is the final step in Advocate Good Samaritan’s campus-wide initiative to convert all inpatient unit beds to private rooms, creating a patient-focused environment that respects the dignity of both patients and their families.